From right to left in the photo: Sam Galloway, Principal Bloomfield High School, Juanita Bell, Jonathan's grandmother, Jonathan Mumby, Rotary Student-of-the-Month, Mark Weisman, President, Bloomfield Rotary Club, Craig Ings, Jonathan's uncle. 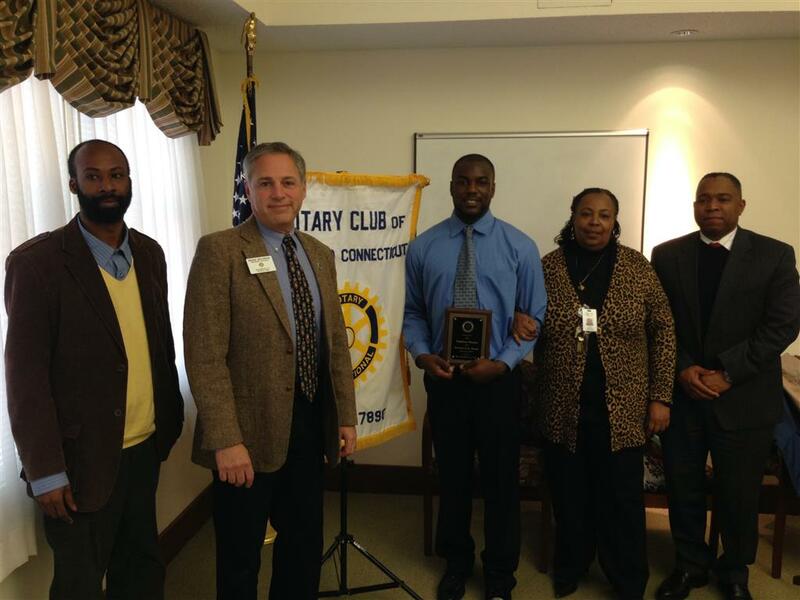 The Bloomfield Rotary Club recently presented its student-of-the-month award to Bloomfield High School senior Jonathan Mumby. He was selected for his excellent academic record and his many extra-curricular activities. Mumby is one of only two Connecticut students selected as a delegate to the upcoming 52nd annual United States Senate Youth Program. He also is an All-State football player and president of Bloomfield High’s Class of 2014. He currently serves on the Commissioner of Education's State Student Advisory Council on Education. Mumby is awaiting an appointment to either the United States Military Academy or the United States Naval Academy.